If you’re familiar with Eye-Fi’s Pro X2 wireless SDHC cards, which have been available for a few years now, you may be scratching your head at what’s different about Eye-Fi’s new Mobi cards. The Eye-Fi Mobi, which is available as a 8GB/Class 10 SDHC card for $50 and a 16GB/Class 10 SDHC card for $80, offers the ability to send full-resolution photos wirelessly as they’re captured to iOS devices and Android devices. Using a feature called Direct Mode, the Eye-Fi Pro X cards have been able to beam images to iOS and Android devices since 2011. The main difference with the Mobi is that it aims to simplify those camera-to-mobile transfers for casual users, and it certainly achieves that — at the expense of a few options that more-advanced photographers might be looking for. The Eye-Fi Mobi lacks some of the features you’ll find in the Pro X2 cards: It doesn’t transfer RAW files, it doesn't sync your images to a cloud service and it lacks the ability to send photos wirelessly to laptop and desktop computers. As with the Pro X2 card, you can also transfer videos wirelessly, but with limitations: There’s plenty of support for different video formats (.mov, .mp4, .mts, .m4v, .mpg, .flv, .wmv, .avi, and .3gp), but you can’t wirelessly transfer videos that are larger than 2GB in file size. So what you get with the Mobi is direct-to-mobile photo and video sharing, with the benefits of a lower price and significantly easier setup than the Pro X2 cards. If you shoot in JPG or RAW+JPG, the Mobi cards represent an easy way to instantly review your photos on a bigger-screened tablet, then edit/share them from your mobile device. The Mobi cards may lack the ability to transfer images to a proper computer, but that missing feature contributes to a very simple setup. Setting up the card is simple. You insert the Eye-Fi Mobi card into a camera and enter a 10-character activation code. You download the free Eye-Fi app to your iOS device or Android device, including Kindle Fire or Kindle Fire HD; enter a 10-character activation code into the app; and you’re essentially off and running. On an iOS device, you need to take the extra step of changing your privacy settings to allow Eye-Fi to store photos, but the Eye-Fi app guides you through that process. Compared to the Eye-Fi Pro X2’s more-complicated Direct Mode setup, it’s much easier and doesn’t require adjusting using your computer to configure your initial connection to mobile devices. You also don’t need to be within range of a Wi-Fi access point in order for the Mobi-to-mobile sharing to work. The card forms a peer-to-peer connection with supported mobile devices; the card itself shows up as a Wi-Fi access point on your mobile device, and joining that wireless network allows you to share between your camera and your phone or tablet. I tested the Eye-Fi Mobi with two cameras and two mobile devices. I used the Canon PowerShot SX260 HS to see how the card performed in a compact camera with reasonably small image sizes, and I used the Nikon D800E to see how it performed with much larger file sizes. On the mobile device side of the equation, I used an iPhone 4S and a Kindle Fire HD, both with the free Eye-Fi app installed. After popping the Eye-Fi Mobi card into the SX260 HS and taking a few shots, I did my first wireless-sync test with the iPhone 4S. I snapped a few test photos with different in-camera compression settings to see how fast it would transfer various file sizes, and then I launched the Eye-Fi app on my phone. On iOS, the card requires a manual connection each time you want to transfer files wirelessly. On the iOS app, tapping the red icon in the top-left corner of the screen (it depicts a camera and a mobile device) brought up a message that said the phone and the camera were not connected. The message coached me through how to do so: Open Settings and select the Eye-Fi card as the access point. I did, and the photo transfer worked quickly after that. Unfortunately, with the iPhone, I had to perform this manual-connection step each time I wanted to transfer photos. After that, it took two or three seconds for each 12-megapixel image to transfer to the mobile device and show up in the Eye-Fi app’s image gallery. There was no noticeable time difference in transferring a 5.3MB “superfine” compression image from the PowerShot SX260 HS versus a 2.6MB “fine” compression photo. Both went quickly. I also shot a 30-second video with the camera (the file size was 128MB), and the transfer time was about 50 seconds for that clip. The entire process was a bit easier with the Kindle Fire HD version of the Eye-Fi app. Using the Eye-Fi app’s “Application Preferences” menu, I set up the Kindle to automatically connect to the Mobi each time the card was detected as within range. As with the iPhone, transfers worked quickly and without a hitch; it took a few seconds for the Kindle to pair up with the card and download images from it. Videos took longer, but not annoyingly so. The Kindle Fire HD version of the Eye-Fi app gives you more configuration options, including the ability to automatically connect to the Mobi when it's within range. While those basic transfers worked as advertised and with impressive speed, I did notice a few limitations with the Mobi during my initial tests. 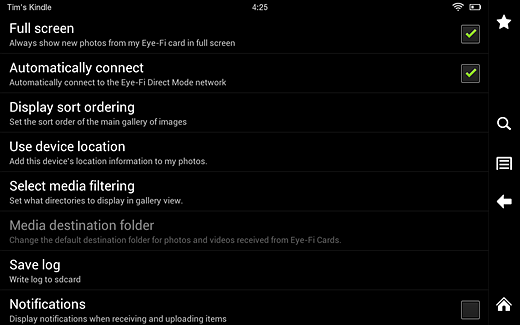 There are also major differences between the iOS and Kindle Fire HD versions of the Eye-Fi app. I’ll cover some of the drawbacks of using the Mobi and the app’s platform-specific features in the next two sections. While you can set up the Mobi card to transfer images and videos to more than one mobile device, that feature has some frustrating limitations. It bears mentioning that the transfers between the Mobi and a mobile device aren’t done by using a “cloud” service. It’s a true peer-to-peer connection between the card and each mobile device; you’ll need to transfer photos separately to each device, and there are usability gaps in that process. For instance, I tried pairing the card up with an iPhone and a Kindle Fire HD simultaneously, hoping that the card would beam photos to both devices at once. It didn’t. It seemed to favor the Kindle Fire HD, and once a photo was transferred to one of the two devices, the Mobi offered no way to transfer the same image to the other device. You basically get to transfer each photograph or batch of photographs to one mobile device, and that’s it. There’s also no way to manually select images to transfer, which would be a workaround for that shortcoming. Once you shoot an image or a batch of images, you pair the card up with your selected mobile device, and it automatically loads all the photos taken since the card was last synced to any device. So if you take a photo and beam it to your phone, there’s no way to beam that same image to your tablet. You’ll need to email the photo from your phone to your tablet. That doesn’t make a huge difference if you only plan to use the card with one mobile device at a time, but if you were thinking of beaming the same photos to multiple devices, forget it. The Mobi wouldn’t be a good solution for a studio setting where you want a group of people to review photos as they’re shot, for example. On the positive side, the lack of simultaneous transfers to different devices and the fact that the Mobi doesn’t use a cloud service both make the Mobi’s wireless-transfer process more secure. Otherwise, anyone who got ahold of your card’s 10-character activation code would probably be able to view your photos. 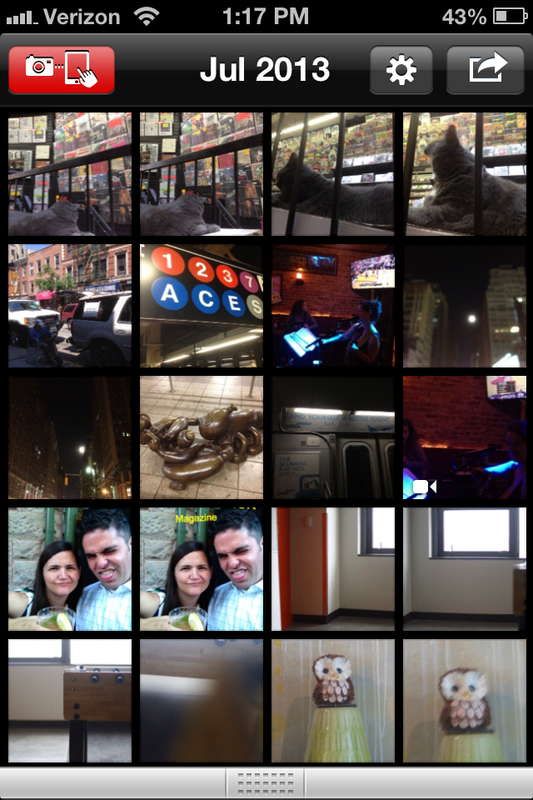 The Eye-Fi app's image gallery is a simple repository of photos, with some basic sharing options but no delete function. Eye-Fi's app doesn't display much data, but you can view full EXIF info for each image once it's on a computer. 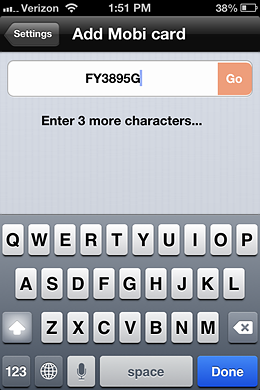 Also noteworthy is the fact that the mobile app is a very simple repository for photos. On the Eye-Fi app, there’s no option to delete photos from the mobile app’s gallery of images. 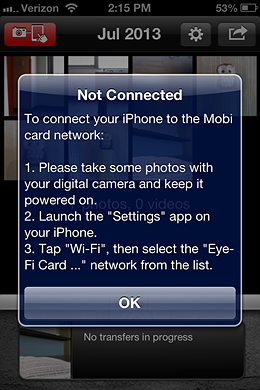 You also can’t delete photos from the card by using the app, and deleting photos from the Mobi card while it’s in the camera doesn’t remove those photos from the Eye-Fi gallery on your mobile device. And while each image’s full EXIF data is retained, there’s no way to view it completely within the Eye-Fi app. All you get after tapping the app’s “Info” button are the file name and the date it was taken, so you’ll need to offload the files to a computer to see the full image data. 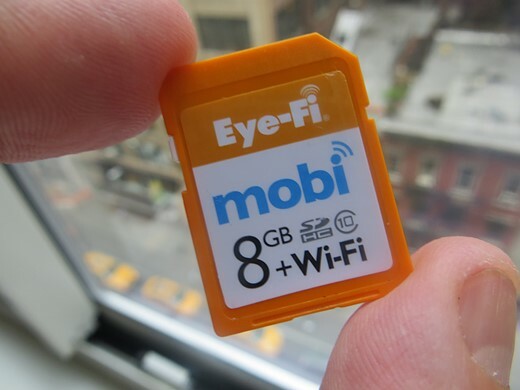 The Eye-Fi Mobi also has a camera-battery-saving feature that disables the card as a Wi-Fi access point each time it completes a batch of wireless transfers. That’s certainly helpful in terms of conserving your camera battery’s charge, but it also means that you may have to manually select the Eye-Fi card as an access point on your device each time you transfer files. This was less of a hassle when using the Mobi with the Kindle Fire HD, as you could set the app to auto-connect to the Mobi card each time it was detected. You don’t have that option in the iOS version of the app, which is just one way that the Eye-Fi app differs across mobile platforms. During my hands-on tests, I discovered that the iOS version of the app and the Kindle Fire HD version of the app vary in significant ways, with different sharing options and fine-tunable settings. In the iOS Eye-Fi app, you have many options for sharing and printing. In the Kindle version, you're limited to emailing photos from within the app. On iOS, once the photos appeared in the Eye-Fi app’s gallery, tapping the gear icon in the top right corner gave me a few sharing options. 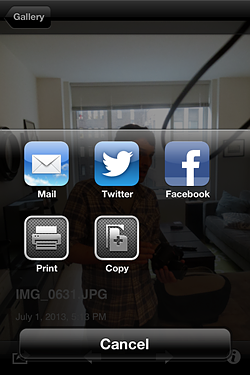 In iOS, you can email images directly from the app, post them to Twitter or Facebook, print them wirelessly from your mobile device if your printer supports that, or save a full-resolution copy of each image to your Camera Roll (that function is listed as “Copy” in the Eye-Fi app’s menu). In addition to the app’s sharing and printing options, you also get a few display and control settings in iOS, each of which have a basic on/off toggle in the app’s “Application Preferences” menu. You can view any incoming transfers in full-screen mode, disable your device’s sleep mode while the app is running, or elect whether to have the Eye-Fi app’s gallery display all photos from your Camera Roll or just the ones saved to the camera’s Eye-Fi card. On the Kindle Fire HD version of the app, photos automatically save to the Kindle’s native photo album, but sharing options are limited to email; the Twitter, Facebook and printing options don’t exist in the Kindle Eye-Fi app. The “Application Preferences” settings include all the iOS options and then some, as you have the option to have the Kindle auto-connect to the Mobi once the card is detected as an access point, geotag your shots using the mobile device itself, and set a destination folder for incoming photos. While my hands-on test with the Canon PowerShot SX260 HS was a good indicator of how well the Mobi would perform with a point-and-shoot camera, I decided to also put the card through its paces with a full-frame DSLR, the Nikon D800E. I did this for a couple of reasons: I wanted to see how fast wireless-transfer speeds would be with the D800E’s hefty 36-megapixel images, and I also wanted to see if I could “fool” the card into transferring RAW images. Here’s how those tests went. 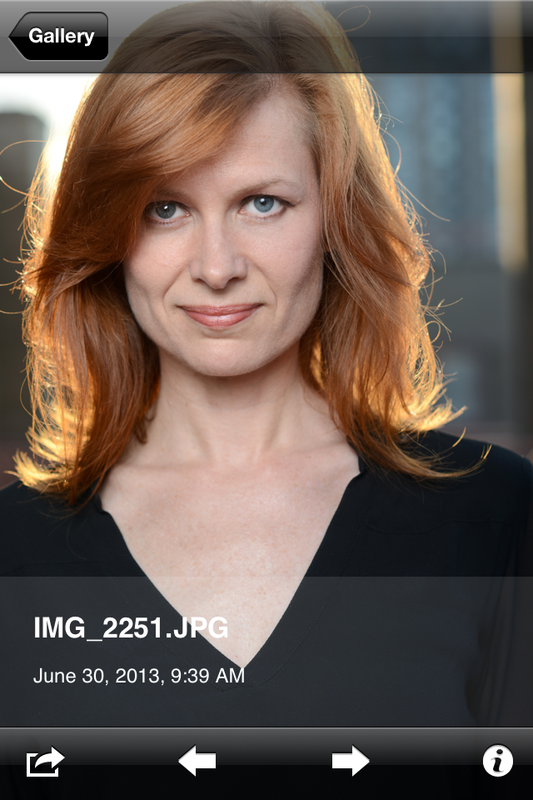 Even at large file sizes, JPEG transfers from the D800E to a mobile device went reasonably fast. The Nikon D800E’s JPEG images can be anywhere from 10MB to 20MB, and wireless transfers of each image took about 10 to 12 seconds each on average -- roughly a second per MB. So the Mobi might be a handy tool for anyone who wants to shoot RAW+JPG, save the JPG files to the Mobi card, and then share the JPEGs to a mobile device. But the step-up Eye-Fi Pro X2 card is certainly a better fit for advanced shooters. As far as I could tell, there really is no way to transfer RAW files wirelessly with the Mobi. During the Nikon D800E test, I noticed that the Mobi only shows up as a wireless hotspot when it senses that it has new JPEG images saved to it. Taking RAW photos doesn’t activate the card’s wireless functionality. Just as advertised, the Eye-Fi Mobi is a wireless card designed for dead-simple sharing. It beams photos and short videos from a camera to your mobile device in an automated, hassle-free way. Advanced photographers should probably take a pass due to its lack of RAW support, lack of manual wireless-transfer controls and inability to transfer the same photo from the camera to multiple devices at the same time. But this isn’t a card that was made with pro photographers in mind, anyway. Casual photographers who just want a wire-free way to get JPEG images from a digital camera to a smartphone or tablet will enjoy the Mobi’s simple setup and fast transfer speeds. It’s simple, but it’s limited. Tim Moynihan is a freelance technology writer based in New York. After two years as Home Page and Features Editor at CNET, Tim joined PCWorld in 2007, and worked for six years as a senior editor for camera, camcorder and HDTV content. Can anyone contribute to the problem I have below? 1) Everything worked fine with the X2 pro 4Gb, but then I bought a Mobi 32Gb (for the extra capacity) , only to find out that it uses another App and the 2 cards are not compatible on the same appliance, (the iPad). I had hoped that I'd be able to use the X2 Pro on a second camera while on location to use simultaneously, but that seems impossible, apart from it acting as a normal memory card. Any solutions please? 2) How do I transfer pics from Eye-Fi app folder to Photos folder on the iPad? Worked auto with X2 pro, doesn't work at all with Mobi, even after playing with the settings. Something the review didn't mention is the GPS location feature. I have the X2 Pro card and when I look at a photo in the Eye-Fi iOS app, and tap the (i) info icon on the image, it shows a "location teardrop" icon. If I tap that, it opens the Google Maps app to show where I took the shot. Granted the X2 Pro uses WiFi to approximate the camera's location, so it wouldn't do as well as the GPS in your iPhone. One feature any of these cards could use but which doesn't seem present--the option to send resized JPEGs to the device, rather than the full-sized ones. You don't need the full fine-large JPEG for social media posting, & the files would transfer much quicker to the tablet/phone as well. Another test of a direct WiFi transfer with no comment about over what distance it will work ! ...and yes I am aware it will differ depending on device, but a ball park guide would be nice. Putting this is perspective. I have a X2 Pro card and with the Sony Rx100 and my Laptop in direct mode the transfer distance is only a couple of feet! (this improves to about 12 feet when I go through the router). Come on DpReview lead the way, lets have some transfer distance measurements - or even guesses (which would be better than nothing). I currently use a Toshiba Flashair card with my wife's Olympus XZ-10. Like the Mobi the Flashair has its own SSID so she can connect directly to that from her iPhone. There is an Olympus camera app that can download JPEGs. The annoying step for her is that before she can transfer she has to go to the Menu and enable the camera/Flashair wireless before she can connect from her phone. That's not really a big deal when you are transferring a batch of photos, but it's a lot of button presses to transfer a single photo. If I understand the Mobi, the only real difference is that it's always on and available for connections without having to enable the wireless in the camera menu? That would make things more streamlined for her. As far as syncing images between devices: iOS users can use Photostream to sync photos between an iPhone and iPad (or even multiple users via a shared photostream). Users of different devices can use Dropbox or Google to sync. If it's any consolation, the X2 Pro cards aren't much better in terms of logical implementation. You can't send photos to multiple devices, so there goes its potential as a viewer during a shoot, and you can't elect to send jpegs to one device and RAW to another, so there goes its potential as a fully wireless studio solution. Why they insist on crippling their stuff is beyond me, but that's always been the way with EyeFi. "Pro" in name only. I don't understand the complaints. If this doesn't work for you, don't use it. Just because your workflow does not cooperate with this card, does not mean the card is rubbish. It seems to me this card is being marketed to people who carry around compacts and want their JPGs to be instantly available to post on social media for casual use. There is a significant enough segment of the population to warrant this, and everything about this card seems perfectly suited to it. If that is not your intention, move along. This is not being marketed as the pro-photog's dream card. I was gonna leave this page after all the usual ubiquituos complains by some individuals thinking finding what's not there make them experts in the field. Morons. I am not sure why DSLR and after market accessory manufacturers are so "hyped up" about getting images directly to a "smart device/cloud". There are very few images I shot with a top quality DLSR that I would distribute without post-processing. I have been shooting since 1976 and besides digital, I still shoot, develop, and print from B&W using film up to 4x5 inches. For Digital I use a Nikon D700 and D300, there are virtually NO photos I would post or show a client without post-processing, the original "image" to me is nothing more than a negative, waiting for me to turn it into my final vision. When shooting B&W film I use color filters to control contrast, dodge and burn when printing in the darkroom, as photographers have since the early days, why do camera manufacturers not get this? Perhaps they do not actually take many photos. Yes, I realize there are needs for journalists and a few others to distribute images instantly, but the rest of us??????? But not everyone includes extensive post processing in their photographic work flow. I like the occasional touch up, but by and far I prefer spending more time with my hands on a camera and not a mouse. Also, the quality of Photo Editing Apps have gotten pretty good. I know many people who use their tablets (and even their phones) to edit JPEGS, which makes transferring images from the camera to a tablet very useful. I agree...i would never send a picture to a client before i had a good look at it on my computer first. But thats me, and thats the way most pro photographers work. I don't get it. For years, now, you plop in a regular Eye-Fi card, shoot, and with zero extra steps, your stuff (including RAW if you care about that) is on Dropbox and/or Flickr, ready to be edited on your phone, tablet or computer. This new Mobi card helps in situations where you're not connected and feel a desperate need to edit your photos before you are connected. That's all. I'll stick to my normal Eye-Fi cards. One note about the iOS interface: I didn't realize until after setting up my mobi and experimenting with two or three transfers, that the Eye-Fi app was also adding all transferred jpgs to my iPhone camera roll -- and this without using any copy or save function from within the app's own gallery, it just happened automatically. This means that it's a piece of cake to select jpgs in the camera roll and share to an icloud photo stream -- meaning that those images are quickly available on my iPad, too (or, via shared photostream, anybody else's I share with). And, because they're in the camera roll, they also get uploaded to dropbox if its app is configured to upload from the camera roll. This latter effect may create some redundancy, but it's also a nice and complete circle -- eye-fi images can easily be pushed everywhere I use jpgs. I was really excited about this card. I gladly traded the "pro" features for ease of setup, not needing an external wifi network, and direct to iOS transfers, which would be for client display (and fun) only, but not needed for my RAW workflow (I still like to do that on a Mac -- but maybe that will change with a hypothetical Lightroom Touch). The big issue for me is that it constantly drops the connection to my WiFi on the iPhone and my phone then connects to my home WiFi network. Any suggestions? I really want to like this, but it is pretty unusable as is. It won't maintain connectivity. I'm on an OLD Canon Rebel (XSi) if that matters. The card fits rather snuggly too. Not a comfortable click into place, as with my regular SD cards. I found that the Eye-Fi Mobi maintained a solid connection with a device when it was outside the range of a home network or another "known" hotspot. When there are competing wireless networks within range of an iOS device, the situation you described above can occur. With an iOS device, any connection that dropped between the card and the mobile device would reconnect by default to a home network or a recognized hotspot rather than the Eye-Fi card. As I mention in the story, this was more of an issue with the iOS app, because you couldn't set it to auto-connect to Eye-Fi upon detection. So if the connection between the Eye-Fi and iPhone dropped when I was at home, the phone would reconnect to a "known" network, which was my home network. With the Kindle HD, it's not an issue, because you can set the app to auto-connect to the Eye-Fi Mobi every time the card is detected as a WAP. That auto-connect feature would be a really useful addition to the iOS app. It is likely that your camera by design cut off power to the SD card after being idle for a while. With no more wi-fi coming from your SD card your phone will search for the next available network (your home wi-fi). That's one of the features of the card, yes. The Wi-Fi signal is activated every time the camera writes new JPG images to the card, then the Wi-Fi signal deactivates once the new JPGs have been transferred to another device. I think what Douglas was getting at (I may be wrong) is that the connection between the card and the mobile device drops out sporadically for him -- and when it does, the mobile device connects by default to his home network. I didn't experience any problems with drop-outs, but I did experience having to explicitly reconnect to the Eye-Fi card on iOS each time I wanted to transfer images. After the iPhone disconnected from the Eye-Fi card, it would automatically connect to a home network, which would be annoying when combined with intermittent drop-outs. Lost me on 'It doesn’t transfer RAW'. I guess I'll be sticking to 'regular' SD cards. The X2 Pro will transfer RAW files to the mobile app or your computer; I've been doing it for over a year. That's why camera with wi-fi is a great idea. Save us $50 and we can use any card. Hear that Nikon, Canon, SONY, Pentax and Fuji? To me it makes much more sense to put wifi in the card. Spend $50 once and use it in any camera. 1) What do you do after the 1 wifi card is full? 2) What if you have more than 1 camera? The hardware for wi-fi & GPS is like $5 for the camera manufacture. No point in charging us $50 for something so cheap. @Reg, Use an 8 gig card on "any camera"? There are six 24mp APS DSLRs and mirrorless on the market, today. Tomorrow, this card will be scrap. @Teru, you missed the disadvantages of the metal shrouds that half-surround the SD card slots in most cameras, the lack of power available in the SD card slot, and the size and orientation of the antenna. Like others commented, this thing has a range on the order of 2 feet. Nikon's smaller external WiFi unit goes 10-20 times farther. Oh, and if a camera maker integrates it into a camera, then there's a UI to set it up. @Pieasdf, artificial price differences abound. There's one right here: AFAIK the Mobi and the more expensive X2 share the same hardware, the only difference is the stripped down software. @Teru, @Peiasdf, @Joseph: You're all making the same assumption that Wi-Fi = Wi-Fi across camera manufacturers, which simply isn't true. E.g. Canon EOS 6D has built-in Wi-Fi, as does the Fujifilm X-M1, yet (aside the fact that both cameras are very different) both require their own special apps and hence have different features and compatibility with your devices. I agree with Reg it makes more sense to spend money on a Wi-Fi card and use it with any camera you like, as it won't matter if you switch brands or use a camera with no built-in Wi-Fi—you still have the same interface (Eye-Fi) you're used to. Besides you can have the Mobi in a 16GB variant as well, which is very useful for JPEG-only shooting. I won't comment on the feasibility of the Pro X2 card with RAW support as Eye-Fi products are really consumer products and not intended for professional work (unlike e.g. Canon's WFT adapters for their DSLRs). Are you merely pontificating again or speaking from experience? In terms of your claim that this thing "has a range on the order of 2 feet " would that be for this particular card or for all Eye-Fi cards? I have tested the Eye-Fi X2 Pro card, shooting simultaneous raw + JPEG and I can assure you that the range is not a mere 2 foot!!!! It may well be that this cheaper Eye-Fi Mobi has a weaker antenna, in which case you may well be right as far as this PARTICULAR card is concerned. The range I was getting, with reasonable throughput speed, was (from memory (I have it written down somewhere) about 20 feet with the signal being slightly obstructed by a wall in my home (I placed laptop in one room and fired the camera from another room but the doors to both rooms remained open). The cameras I used to test this was a Canon 1Ds Mark II and a Sony R1 with the Eye-Fi card enclosed within a CF-to-SD Card adapter. I've been using Eye-Fi Mobi with my D800 with good success. I shoot with raw+jpg. Raw saves to my CF card while jpg goes to the eye-fi card. My main purpose is to allow for quick posting of snapshots to facebook from my iphone. My d800 jpg settings are small+basic which is good enough for facebook. I then import my RAWs into Lightroom after I have access to my main computer. I actually end up just erasing my eye-fi card and most of the pics I just imported to my iPhone after I've uploaded my snaps to Facebook. I think an improvement would be if could simply just choose the few pictures I want to import to my phone rather than everything. 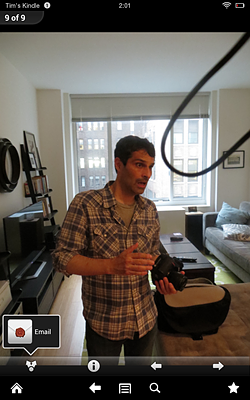 Overall, it's a pretty good solution for using a big dslr but still being able to post snapshots in a mobile scenario. I would be interested in hearing about the workflow of Canon/Sony/Panasonic who have cameras with native wifi capabilities. Looks real nice if it would work for you. Wouldn't for me, so I'm not buying. I hope there are firmware upgrades to fix that long list of unnecessary limitations. Well, the sheer range of lacks and limitations makes me appreciate my USB cable even more... Thanks for the review! Special thanks to Dave Rubin (http://www.dsrphoto.com/) for letting me borrow his Nikon D800E for this piece. Many thanks for the review Tim, much appreciated. Just a quick question: what kind of range from the D800E did you get when using the card for the quick transfers - did the transfers fall off when the distance between camera and device was increased? Unfortunately, I didn't really test for range in this hands-on. All the transfer tests I did with each camera were within 2-15 ft. of the mobile device, and there was a clear line of sight between the camera and the mobile devices. I didn't see much variation in the transfer times between those two distances. According to Eye-Fi, the card's range is 90 ft. outdoors and 45 ft. indoors, although there's no information regarding slowed-down transfer times if the devices are farther apart. I hope this info helps -- sorry I didn't test for this myself. Personally I use the regular Eye-Fi connect X2 just as described. For backing up photos from the camera to the phone. Sometimes a bit slow, depending on network traffic, but otherwise very useful. 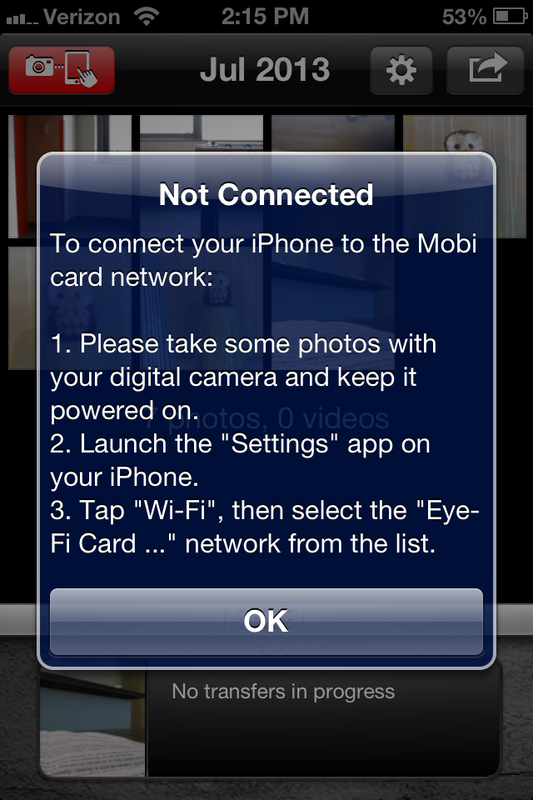 I can fully understand why Eye-Fi came out with this special mobi version. * We chose to not support RAW with Mobi since it's intended for mobile devices, and iOS and Android do not support RAW file formats. The Pro does, but when you upload the RAW files to the mobile device, it doesn't know what to do with them and you need to use 3rd party apps, to handle them. * iOS DOES connect to Wi-Fi and the Mobi's Wi-Fi automatically, IF it's not already connected to another network and there is no way for 3rd parties (like Eye-Fi) to force iOS to drop off the current Wi-Fi, and connect onto our Wi-Fi. On Android, it's possible, and that's why your experience with the Kindle Fire was better. But if you were up and about and your iOS device was not connected to Wi-Fi already, it WILL automatically connect to the Mobi card. * iOS doesn't allow 3rd party apps to delete media from the photo roll. We can only inject content into it. Hence the reason for not being able to delete, from within the app. * in terms of sharing -- all the intents in iOS and Android are there, as if the photos and videos were shot with the mobile device itself. * in terms of getting photos to your computer -- it's still possible with Mobi. 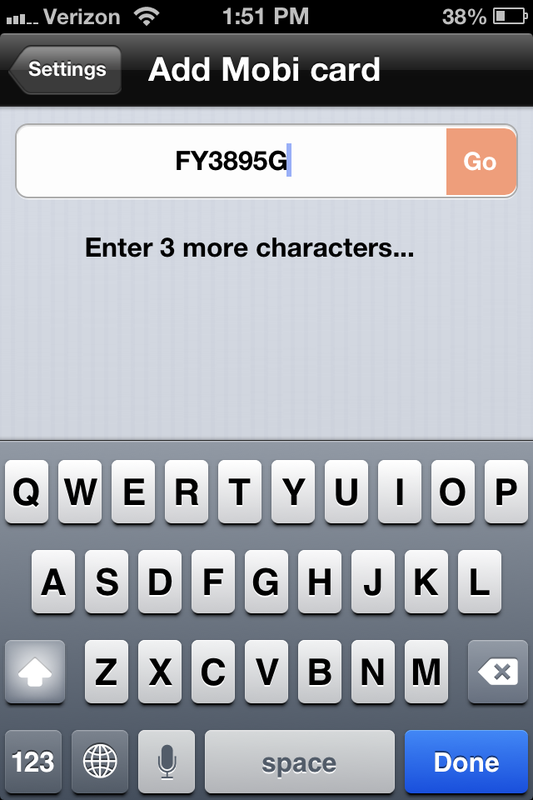 On iOS devices, iCloud works great. On Android devices -- Google+ GDrive. Or DropBox works across platforms. Basically, the existing cloud services that people are used to -- work with the Mobi card since the photos and videos that we upload, reside in the Photo roll and the Gallery, on Android. So in terms of having the photos show up on a few devices, at an event, it will not be possible, in real-time, since Mobi is the secured Wi-Fi hotspot. But once the device can get back onto Wi-Fi -- it can sync over something like iDrive. Ziv, that's not entirely true. Just like on desktops and laptops, what really defines "support" is the apps that process raw files. Multiple raw decoders, including the popular LibRaw, have been ported to both IOS and Android, and there are several apps in the App Store and Google Play that use LibRaw. @Joseph With all respect and to be fair to Ziv, I think you're missing the point. If you've had a look at RAW developers for iOS or Android, you'll find they are few and far between and have poor support for any kind of RAW format, not to mention their lack of usability as RAW processing requires a lot of speed and power that conventional mobile devices simply don't have. Even the latest iPad with the A6X chip works very poorly with the best RAW developer app available on the App Store. A few things: the Mobi is intended for mobile devices, as Ziv mentioned above, and so it only makes sense for Eye-Fi to focus on making that experience the best possible one. Casual photographers simply don't care about RAW and even if they did, they wouldn't try it another time on a mobile device once they've seen how it works on iOS or Android. The Mobi is marketed towards the Facebook and Instagram crowd. It's perfect for them. Don't shoot it down just because it doesn't suit YOUR needs.